At Venice Toyota in Florida, you’ll find special financing offers on the new Toyota model you’ve been dreaming of! 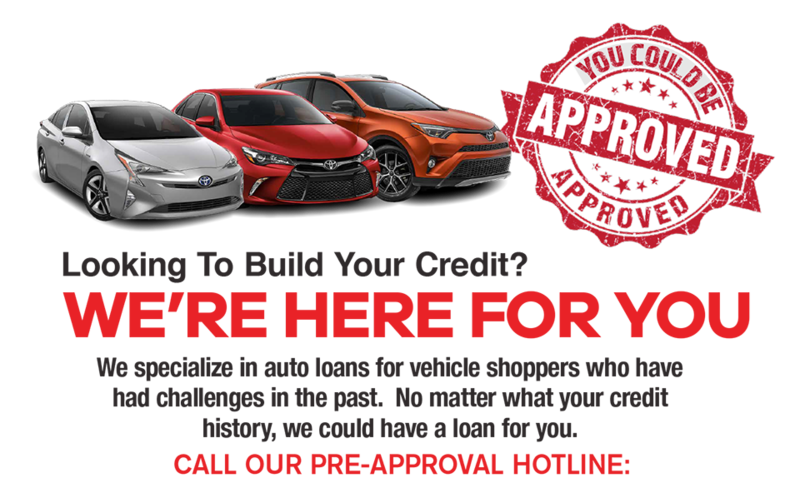 Whether that’s the impressive Avalon, stylish Camry, efficient Prius, roomy Highlander or powerful Tundra, our Venice Toyota Professional Finance Center has a deal for you. We are proud to offer Osprey, Englewood and North Port, FL, area drivers pre-qualification options for every budget! The auto loan experts in our Finance Center will happily work with you to get you in the Toyota you want with a payment plan you can afford. Even if you have been turned down at other dealerships, we offer special financing options to help you get in the Toyota you need. Best of all, driving your new Toyota and paying off your loan will aid in building your credit. Ready to start the auto finance process? Bradenton, Venice and Sarasota, FL, drivers can get pre-approved now without even having to come into the dealership. Simply fill out our Online Financial Application to be well on your way to getting your new Toyota! If you’d rather come to our dealership located “20 minutes from anywhere” at 900 US 41 By-Pass South Venice, FL, we’d love to walk you through the process in person. We look forward to seeing you soon!